Violence Erupts As Palestinians Protest Trump's Action On Jerusalem : The Two-Way Days after the president's recognition of Jerusalem as Israel's capital, protests spread throughout the Muslim world. 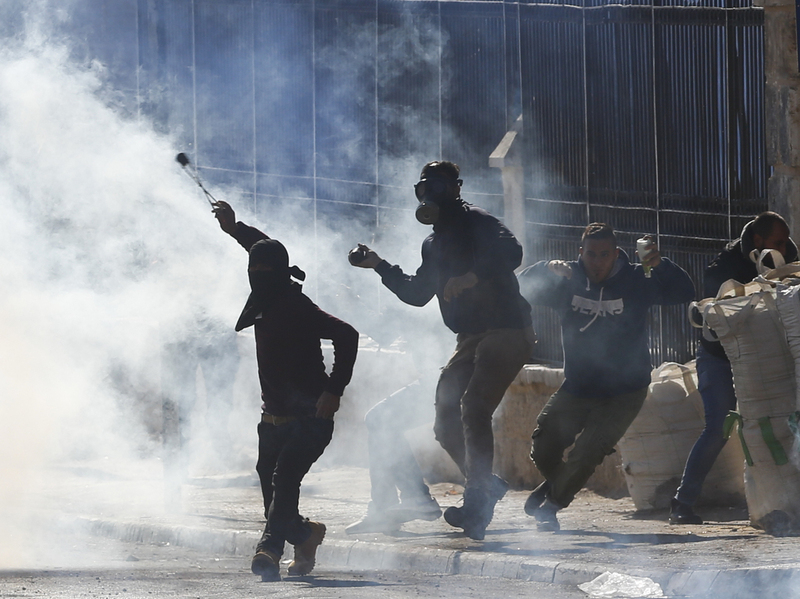 Violent clashes erupted in the Palestinian territories. Palestinians in the West Bank clash with Israeli troops during a protest against President Trump's recognition of Jerusalem as Israel's capital. Scores of Palestinians were injured Friday in the Palestinian territories of Gaza and the West Bank by Israeli live fire and rubber bullets as thousands took to the streets in the second day of protests against President Trump's recognition of Jerusalem as the capital of Israel. Two Palestinians were reported killed, one a 30-year-old man during the street clashes in Gaza. In the West Bank, Palestinian stone-throwers were met by Israeli soldiers firing tear gas and rubber bullets. Israeli warplanes struck Hamas military targets in northern Gaza in retaliation for missile attacks launched against the southern Israeli city of Sderot. Several cars were damaged, but there were no casualties. Two of the missiles failed to reach Israeli territory. As NPR's Daniel Estrin reports on the airstrike, "Palestinian health officials say at least one Palestinian was killed, and at least 15 were wounded including two infants. One is reportedly in critical condition." There were confrontations in Jerusalem itself as several hundred Palestinians gathered for Friday prayers at the Al-Aqsa Mosque, Islam's third-holiest site. At the walled Old City gates, worshippers chanted "Jerusalem is ours, Jerusalem is our capital!" Scuffles between protesters and police were reported. The protests rippled throughout the Muslim world and beyond. The Associated Press reports that thousands denounced Trump's decision in neighboring Jordan's capital of Amman, as well as in Indonesia, Malaysia, Pakistan, Egypt, Algeria, Turkey, Iraq, Iran and other Muslim countries. The actions come in response to a call for three "days of rage" by the Palestinian Fatah movement and other groups. That group's militant rival, Gaza-based Hamas, has called for a third intifada. Palestinian groups are calling for more protests on Saturday, says Daniel, while Israeli government ministers are pleased with Trump's decision. "Israel has long felt the international community undermines Israel's right to Jerusalem, Jewish ties to Jerusalem. "Actually there are reports that the Israeli Parliament on Monday could pass a bill that would put up obstacles to Israel ever ceding parts of Jerusalem to the Palestinians in the future. "Today also the U.N. Security Council held an emergency meeting. The Palestinian ambassador to the U.N. said the U.S. had disqualified its role in leading peace efforts. Though the U.S. ambassador to the U.N., Nikki Haley, said actually with the Trump administration's diplomacy, we might be closer to peace than ever."